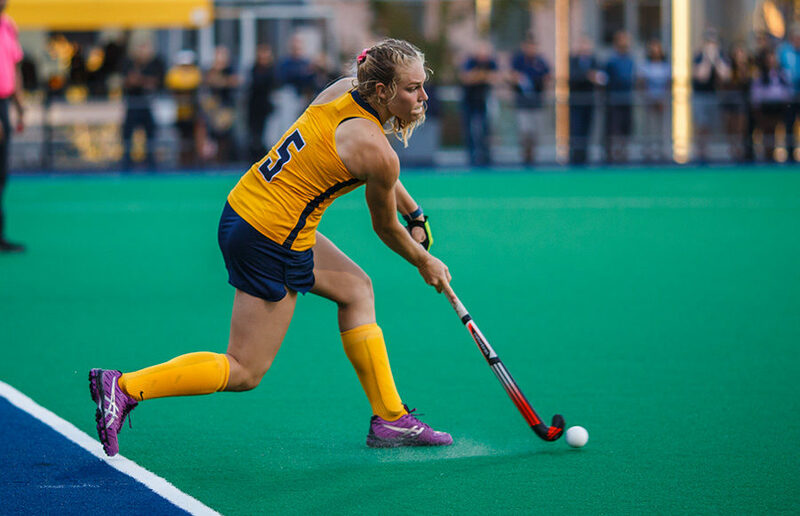 Cal field hockey has its eyes fixed on earning a pair of upset wins this weekend at the Buckeye Invitational, where it will take on nationally ranked No. 5 Penn State (10-2) and No. 25 Ohio State (6-5). The Bears will arrive in Columbus, Ohio, with confidence after having secured their second win against an American East Conference contender and in the midst of a win streak. The Bears have had their share of difficult matchups this season against ranked teams and thus far have been able to win one of three against currently ranked teams. Both No. 5 Penn State and No. 25 Ohio State have had a hefty schedule this year, as they have faced off against seven and five currently ranked teams, respectively. Of the two, Penn State has had more success against these top-tier teams, winning five of seven, while Ohio State has won two of five. One thing’s for sure — regardless of the strength of the schedules each team has had, they’ve all demonstrated that they are aggressive. The Buckeye Invitational should result in a thrilling showdown among three vigorous teams. The last matchup between Cal and these two teams came two years ago. Cal took the win against Penn State 3-2, while Ohio State overwhelmed the Bears 6-3. The meeting between these teams is well overdue, and there’s no reason to expect the old results to hold. These three teams have generated exceptional stats ahead of this weekend’s meeting. Penn State leads the trio in goals with a hefty aggregate of 38, after which are the Bears’ sizeable 29 goals and the Buckeyes’ modest 20 goals. The Bears, who have allowed 1.80 goals per game, should be able to maintain a grip on both of the opposing offenses. Penn State has been able to score 3.17 goals per game this season, ahead of Ohio State’s 2.00 per game. With a defense that has been performing well this season led by sophomore goaltender Danielle Mentink, Cal has more than enough strength in the backfield to slow down these two teams. Offensively, Cal should shift its focus on scoring against Ohio State and Penn State. Both opposing teams have been frugal with goals allowed per game. Penn State has allowed 1.33 goals per game, while Ohio State has allowed 1.50 goals per game. The Bears’ offensive unit looks promising heading into this weekend, with 2.90 goals per game. Some of Cal’s dynamic offensive standouts, including freshman Megan Rodgers and sophomore Femke Delissen, lead the team in goals and assists respectively and should be able to continue to guide the team to victory. If Cal is able to remain victorious after this weekend, it’ll be on track for a national ranking and a playoff appearance.